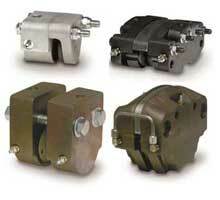 Tolomatic hydraulic caliper disc brakes are available in the widest range of sizes. With 7 different series to choose from, these brakes can supply the braking torque required for a wide variety of applications. They feature replaceable high-grade friction material, Buna-N seals, alumnimun or cast iron construction, bleeder screws and zinc plated bolts. Options include EPR seals, Viton seals, retractable pistons and floating brackets.